Benefiting from a deliciously sweet fruit and stunning flowers our peach trees are productive and also less susceptible to frost damage. 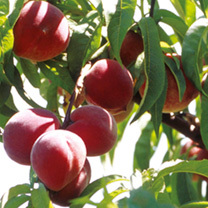 There are plenty of peach trees which you may want to grow such as the glorious Peche de Vigne or the Avalon Pride which is amazing for breeding. 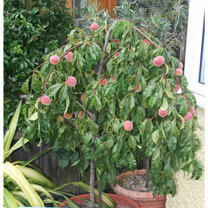 Browse our range of peach trees and try something different today. You can trust that your peach tree will be despatched at just the right time for you to successfully plant and grow it in your garden. All our trees are hardy to the weather so you can be rest assured that they will survive in all seasons. Quality guaranteed! Picking a sun ripened peach off your own tree doesn't have to be a dream anymore. With hardier peach tree varieties available, and the use of dwarfing rootstocks, it is much easier to grow your own than you would think in the UK. There are also very dwarf plants that can be grown in pots, so if you have a very sunny little patio it may be an excellent place, and being self-fertile you will not need another tree nearby as a pollinator. All you need is a south facing wall or fence, or a sunny, sheltered spot with well drained soil, for your tree. Peaches can be grown as a bush, but the fan is probably the easiest. Nectarines, the smooth skinned sister of the peach, can also be grown as a fan. 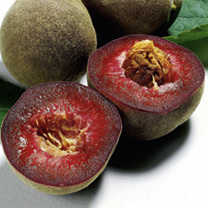 They are not as heavy yielding as the peach tree, and are more tender, but still worth having. Finally, why not try an apricot? 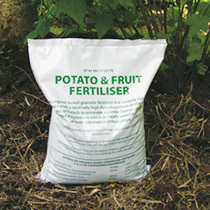 Modern varieties are much hardier, and better suited to the UK climate, plus they crop very well. The same method of culture can be used for all these stone fruits. Plant your peach trees in autumn while the soil is still warm, this will allow them to establish themselves before the spring. Dig the soil over well to avoid the young tree roots having to struggle, incorporating plenty of organic matter before planting. 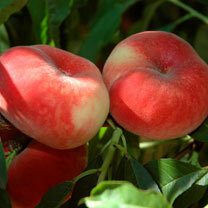 Peaches and nectarines are very fussy about soil, they don't like it too wet or likely to dry outtoo quickly. When planting against a wall make sure that the soil is well dug, with plenty of organic matter, remove any loose builders rubble or stone. Watering will be more critical in this location as the base of walls is often sheltered from rain. If possible protect the plants if frost is expected, or heavy rain to reduce damage to blossoms. Blossoming is very early in the year when there are fewer pollinating insects about. Give your plants a little help with a soft artists brush or cotton wool to move the pollen from flower to flower. Keep weeds down and water well, especially when the fruit swells. Thin fruitlets to around 20cm (8") between fruits. Modern apricots have the ability to carry all set fruit to maturity with little reduction in quality, however thinning to allow 7.5-10cm (3-4") will result in even larger fruits. Prune peach trees in early spring at early leaf stage to avoid any spread of disease such as leaf curl or silver leaf. If fruits are to be eaten straight away choose the tree ripened fruits, if they are to be stored for a week or so, pick before fully ripe (when the fruits are greenish yellow). Fruit will not ripen uniformly, so there will need to be around two to three pickings.